* Lime In The Coconut: :: GIVEAWAY::…Beautiful umbrella and four outdoor pillows…’cause summer is a comin! :: GIVEAWAY::…Beautiful umbrella and four outdoor pillows…’cause summer is a comin! It is umbrella time friends. Little itsy umbrellas in training...we all start somewhere…no? small family owned company…my favorite kind. woooo…choices! Who doesn't Love a good color choice? at a value of $416.00! did I say generous? No more broken or bent ribs from windy conditions or bad falls. The fiberglass ribs are typically 4 times stronger and up to 30% lighter than metal or wood ribs. In wind tests performed by the University of Miami, it was shown that the bending and flexing of the fiberglass ribs, spilling wind energy around the umbrella, makes it wind resistant up to 50 MPH! tell me which color combo you would loveto wrap your summer in.What is the color that floats your boat?or sails your umbrella? 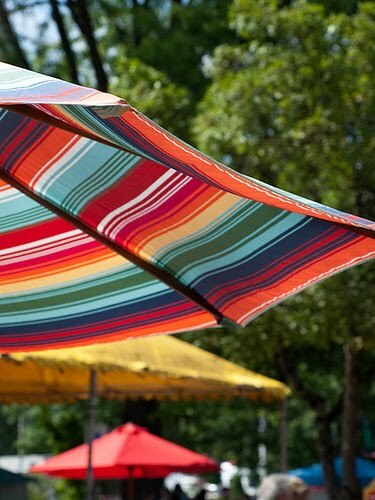 Want additional chances at sitting under your fave color umbrella this summer? Blog, Twitter or Facebook about this giveaway and leave a separate comment on this post with each link. Become a Facebook fan of the store, and you can earn yet another chance. So in all you can earn 4 chances... if you want. Want to REALLY increase your odds of winning? Winner will be chosen on Thursday April 22nd at midnight. And announced on Friday. Wanna know something else groovy? umbrella in Australia is umbrella…with a cool accent. Cushions and Umbrellas ships internationally using BongoUS. They will ship for free within the US, but international shipping will need to be paid by the entrant. International winners or buyers can set up an account here. For myself... I would choose the umbrella in "Spa" and the cushions in "Suwanee Spa". How did YOU know I had duct tape holding two arms of my umbrella together! It flew up and out of its stand last year during a weird wind gusty storm, and broke two arms! I love the idea of the fiberglass ribs! Genius! If I were to be the winner (and I'm visualizing it now...) I would love the 5488 Teak for the umbrella (to blend with my landscape) and the B298 Suwanee Olive print for the cushions. Pretty! And in my ever-zealous attempt to up my odds of winning, I became a fan on Facebook too! :) I like that they are a small family owned business. That just makes it even better! Canvas Macaw and Saddle!! I would LOVE to win this contest! Fingers crossed! Linda your comment on my blog was hilarious! THanks! I would love to win one of their umbrellas!! Oh Linda - I'm sighing! BOY AM I SIGHING! I would LOVE to win this. What a great giveaway! TY, TY, TY! Gee, I would either choose the suwanee olive or armona olive stripe and the 5476 heather beige umbrella - or, the spa striper, and terrace polar with the 5413 spa umbrella. I can't decide. They're all so lovely. Hmmmm. Off to sit and sigh, will that really work? LOL! Ooooo! Don't forget to come by and check out the changes in the yard. I think that you'll love them! I would love to relax with my beautiful 4 year old daughter under the "Tangerine" umbrella and the cushions in "Suwanee Flamingo". She is facinated with umbrella's and would LOVE this one! Oh they are all so pretty! But I would have to go with Spa for the umbrella and Suwanee Jet for the cushions. Blogged it and became a Facebook fan. Hmmm. This is tough. Such gorgeous colors and patterns. But given the coloring of my surroundings, I think I'll go with the camel for the umbrella and the armona flamingo stripe for the pillow. My fingers are crossed, and Sadie is crossing all her toes, too! PS. Love the look of your blog right now! Ooh . . . perfect timing as our umbrella is on its last rib/leg this year. I'd choose 5429 Macaw for the Umbrella and B298 Suwanee Olive for the cushions. Ahhhhh . . . it will blend right in with my big old "treehouse" deck. Crossing my fingers . . .
First off the new header and lime background look so fantastic!!! I would love to win the Spa umbrella and cushions/pillows in Cherry Hill Opal. What a fabulous givaway from a wonderful company! Sh happy to have the introduction. This is such an awesome giveaway! I sooo need an outdoor umbrella! I would choose the Black for the umbrella and the cushions in Suwanee Flamingo. It would look so fab! sigh. This is simply an amzing giveaway! Wow. I would, love, love, LOVE - beyond love - to sit in a set decked out in the Bravada Limelite fabric. Swooning over here...thanks for the chance! Stunned. Shocked. Wow. Pleeeease. Seriously, you are so stinkin' cute. And I would love any of them, but Palm green would be great! Thank you for sharing with me about your giveaway... but mainly thank you for being you. Wow, Linda! This is SOME giveaway!! Nice publicity for cushions and umbrellas because you have such a great following! Ooooh I soooo NEED an umbrella... my market umbrella pole is abot to snap in half... I'v been shopping around looking for one... please do not include me in your giveaway... I'm hoping to have a NEW one in RED this week-end... Bonne Chance to everyone!!! Ooooh but I will take a drink with an umbrella in it!!! What a coolio give-away! Thank you to Sharon for the shout out. Tough call on the fabrics but Derby chili or Davidson Redwood for the umbrella and the cushions.....Passion Ruby looks nice. Yup - that'll do pig. All we are having is rain rain and more rain, so It would be used here for alittle different kinda shade. Rain shade. egads, will it ever cease??? love it, Ill take the lounge chairs, too..lady. spa & suwanee spa. what an awesome giveaway! How fun!! Thanks for the opportunity! I would choose the macaw or palm umbrella-depending on my mood the day I win. And the "passion ruby" print pillows to go with my stripedy settee and new umbrella. What a great giveaway! I actually NEED a new umbrella. I would love to sit under a BLACK umbrella and get cozy with the ARMONA JET STRIPE pillows. Fingers crossed!!! I have blogged about this awesome giveaway! I AM IN LOVE with TANGERINE for the umbrella and Chamomile strip for the cushions. too beautiful!! what a lovely give away!! i would choose natural white umbrella with pillows in armona jet stripe and suwanee jet. crossing my fingers! As always, such an entertaining and fun post, Linda! And such a generous giveaway! I became a facebook fan so I can get two changes to win. Thanks! Mmm. I likey mango stripe for the umbrella and coral for the cushions. Also like you for such a cool giveaway! Thank you for this fun giveaway! I am thinking the Taupe for the cushions and the Terracotta for the umbrella.. I tweeted too.. best of luck! And I am now a facebook fan. Tough choice! I like heather beige (5476) and terrace polar (B223) for the pillows. What a GREAT give away, just as we are beginning to plant, sit outside and settle in for the summer heat! I would choose NATURAL WHITE for the umbrella and SEASIDE STRIPE for the cushions. Spa umbrella and Cherry Hill Opal pillows, please! :) Great giveaway; thanks!!! Spa umbrella and Suwanee Spa cushions! I'm getting a new house this summer . . . an umbrella would be really, really nice. wow, gorgeous! for the umbrella I would choose 5413 "Spa" so serene. As for the pillows, B223 "Terrace Polar" so very dainty. This giveaway is well-timed as I just had to get rid of the sad vinyl patio umbrella that came with my home. My house is turquoise, so I think an umbrella in tangerine would add some fun contrast. The suwanee flamingo pillows would be great for the bench I want to build. And of course I also friended them on facebook and now I'm crossing my fingers that I'm the winner. Oh, please, please, please let me win. I am so in need of outdoor duds. I'm feeling like our outdoor spaces are looking one step above a, well, I can't say in a public forum. My pics are Armona Jet Stripe for the pillows and Natural White for the umbrella. So exciting and what a fabulous giveaway this is! Awesome! My poor umbrella...it's still quite functional, but UGLY! It's all faded and just plain gross, but it still works. I'm absolutely in love with Dolce Mango - yummy!! umbrella in canvas and cushions in spa stripe would love mah-va-less out around my pool! what a lovely giveaway! keeping fingers crossed that i win! What an awesome giveaway...., really tooooooo bad that I'm all covered, literally. Enjoying the outdoors under my covered porch, and don't need an umbrella at all..., so don't count me in, just needed to vent my tiny bit of excitement! This is such an amazing giveaway, after a crazy storm destroyed my gazebo I would love to have an umbrella and pillows, I so need some shade. I would choose a Coco umbrella and Armona Spa Stripe pillows. Love it! Hi! I'm new to the blog. My husband and I are in the process of buying our first house, and we've been looking through blogs for ideas on decorating and re-doing. Thanks for the contest! For me, I'd choose the umbrella in Dolce Mango and pillows in Marine Stripe. Canvas Macaw and Saddle..... please!! Thank you for your nice comments on my blog. Your blog is wonderfully inspiring as usual, and makes me soo happy! Gorgeous. And the pics make me want all of the backdrops too!! Wish I had an umbrella bearer! Already sunburned this week while on site designing a landscape. I really love the orange paisley in your post, but if I can't have that I'd choose armona charcoal stripe cushions and canvas umbrella. Great giveaway! I'm a fan on Facebook! Great giveaway, thank you! Dolce Mango please! It would be a fantastic compliment to all my pink geraniums! All their fabrics are gorgeous that it is so hard to pick a favorite. For the pillows I would pick Armona Olive Stripe, although Suwanee Olive is pretty too. Now on to the umbrella choice...I love the color Palm but not sure if it would match the pillows. Beige would probably be the best choice. Just blogged about the giveaway. I still can't get over how awesome this giveaway is! Sharona . . . you crack.me.up! You should win on determination alone, besides the fact that you are so sweet. Heee! Spa and suwanee spa plz! Linda how great...I can use one! How about Bravada Salsa stripe? i would chose the henna for umbrella and castanet for cushions..
yep, and along with umbrellas, a new hammock! These are gorgeous! I would love, love the umbrella in Spa and the cushions in Spa stripe! I think the umbrella in SPA and cushions in SPA stripe....maybe....??? hard to choose. Great giveaway! Thanks! Great Give-Away! Had to open several windows so I could view the Umbrella colors with the Pillow choices!I would choose the "5422 Antique Beige" Umbrella with "B210 Terrace Tomatoe" pillows! All the best to you! Tangerine color for the umbrella and hmmm, print names don't come up on the screen: they are all cut off. Well, the tangerine print, 2nd row. What a giveaway!!! Fabulous; and yes, I need one for my new house! Oh yes, yes, yes I am going to work on all these chances to win, what have they got for skeeters? This is awesome. OK now i'm goin shoppin. Oh tay, 5429 Macaw for the umbrella, and B 210 Terrace Tomato for the pillows. Awh I would so love to win yep yep. Link on my blog post done and link posted on facebook.Done. NOW for happy thoughts!!!!! Love the Dolce Mango and Castanet Beach. I'd have a hard time deciding! But bright, colorful, and stripey are definitely the way to go on a happy summer day! Just found you through Tara Dillards blog. I would pick a white umbrella and the Jet Stripe for the pillows. I love the flamingo pillows and a plain umbrella fabric to match. Wow, how incredibly generous! I like a nice striped umbrella: how about Davidson Redwood and pillows in Kingsley stripe? Fabulous giveaway, thanks so much! What a wonderful giveaway! For the unbrella, I would choose tangerine, and for the pillows it would have to be Terrace Tomatoe. C'est bon! Merci! You know how I love umbrellas!! I'd go for the Cocoa umbrella and Passion Ruby pillows! what a great giveaway! i would have to choose the umbrella and cushions in spa.... so lovely! The Mango Stripe is delicous, what a fabulous giveaway!!! I adore the striped ones!! Count me in!! Fabulous giveway!! Awnings like that . I lost mine in a wind storm. Great post. What a generous give-away, Linda. Have a great weekend. would LOVE the tangerine umbrella with Armona Flamingo Stripe cushions! hellllooooo summer entertaining! just tweeted a link to the giveaway including @cushandumb in it! Facebook fan of their page - yeah for small business owners!! yea for summer!!! OMG, that picture of all the pink and red umbrellas is gorgeous!!!! umbrella and oh I don't know! for the cushions! Guess I will decide if I am chosen the lucky winner! Thank you! and the flamingo stripe for the cushions. awesome! opening our pool -first time in 3 years. would love a little help in the outdoor cushion-ey dept.! i am going now to tweet about it! I have been searching for an umbrella like this in Pacific Blue! I would love to see it on my patio with the Marine Blue pillows. I would definitely choose brass for the umbrella & Davidson Redwood for the cushions. Awesome Give a way!! I would choose the derby chile umbrella and the suwanee jet for the cushions, love them all though. I commented earlier with my original entry and then followed it with another comment about following them on facebook. This morning I woke up and the giveaway inspired a blog post. I'm so boring....Navy and Marine Stripe! Great giveaway, Thanks! Dolce Mango all the way-reminds of sitting on some beach with a fruity daquiri or a rum punch in my hand! What a great giveaway Linda-if I win I will fly you here to enjoy my new umbrella and cushions - well, maybe one way...LOL! Wow, I feel like I've been on vacation just by visiting your blog! I'd love to relax under a Cocoa umbrella, seated on Passion Ruby cushions. Thanks so much for the giveaway! What a great spring giveaway. I love the Kingsley with the palm. Ohh, someone is going to be lucky. Hello, very generous give away. I would select the macaw (lime green) umbrella and the marine stripe (blues) pillows. What a wonderful giveaway! I love your gorgeous blog. I would choose Pacific Blue for the Umbrella and Suwanee Spa for the pillows. Oh no Ms. Lime in the Coconut. . . I would love, love, love to win this give-a-way. . . I cant even begin to chose! My back yard would be forever indebted!!! My fingers are so crossed! AND I am wishing on some stars! I am also becoming a fan! Pacific Blue is my color! With suwannee tangerine pillows. YIPES!!STRIPES!!! LOVE YOUR BLOG, BUT THE GIVEAWAY IS AMAZING. CAN'T DECIDE, BUT THINK UMB-5429 LIME FOR UMBRELLA AND B295, B299, 289 AND 288 SUWANEE JETS AND FLAMINGO FOR PILLOWS. I CAN'T WAIT -- I HOPE, I WISH I COULD WIN. YIPES; STRIPES!! !SUCH A FUN BLOG AND NOW THIS AMAZING GIVEAWAY. LINDA YOU ARE AMAZING. I WOULD LOVE, LOVE THE LIME GREEN UMBRELLA W/ TANGERINE AND JET SUWANEE PILLOWS. PLEASE, I REALLY WANT TO WIN, BUT IF I DON'T I'M HAPPY FOR WHOEVER DOES. GREAT GIVEAWAY. What a wonderful giveaway. They are all beautiful. My choices are Saddle for the pillows and Palm for the umbrella. Keeping my fingers crossed. suwanne pillows and a palm umbrella would be fantastic! What a fabulous giveaway!! Not a doubt, love that cool deep Forest Green. Goes with my little forest. Hope, hope. I love the Black Umbrella with the Sawanee Jet. I'd pick the tangerine umbrella and palm cushions. Would it come even close to matching our house? Lord, no, but it would be fun and summery! Oooooooh, what a fabulous giveaway! I would make a daring and bold choice (for me)...Tangerine for the umbrella and Suwanee Flamingo for the pillows. My fingers are crossed. Thanks again! I love the sunbrealla 5413 spa for the umbrella and suwanee flamingo for the pillows. What a great giveaway! I thin kI would choose Heather Beige and Suwanee Spa. Kingsley stripe pillows & Heather beige umbrella! I would love the umbrella in tangerine and the pillows in Suwanee Flamingo. So bright and cherry! PLus the fiberglass ribs would hold up to chicago winds. Pal and Thorndale Opal! I love the combo! Would love to have the umbrella in Navy and the cushions in Marine Stripe. Thanks for the chance to win! I love teals and aquas ... soothing and makes me think of the beach .. my favorite on the Cushions and Umbrellas site is the Sunbrella Seville Seaside (5608) color combo! I love this umbrella in the Pacific Blue or Tangerine colors. So bright and vivid. The wind broke our umbrella last year, but it wasn't nearly as pretty as this one! And for the pillows I would choose Suwanee Flamingo. So pretty! I would do the Seaville Seaside for my umbrella and the cushions...well I couldn't decide!! So maybe by the time I win, I'll pick one!! I like the Sunbrella® 5608 Seville Seaside. It's perfect for outdoor fun. Beautiful! Waaah, I;m trapped inside working andf your post made me yearn for sunny days reading in the grass WAY too much! I'd like my umbrella in Palm- to keep that sunny-spring feeling all year, even when it's blazing white hot! I would love the "Vellum" umbrella and the "Armona Olive Stripe" pillows! My favorite color is for sure the Spa umbrella and the Spa Stripe cushions! I would choose Suwanee Spa. Love it. I would choose "Palm" for the umbrella and "Suwanee Olive" for the cushions! I would choose the Derby Chili stripe for the unbrella, and the Armona Flamingo stripe for the pillows. I soooo need an umbrella - so this would be an awesome win! "Spa" and the cushions in "Suwanee Spa", comforting and peaceful! Cushions - Tomatoe Stripe is the color for me! The squirrels chewed up our cushions, I could TOTALLY use new ones! I like the navy set. Lovely! I love the Derby Chilli for the umbrella and Tomatoe Stripe for the pillows! I would love the Tangerine umbrella and the Suwanee flamingo pillows. I really need a new umbrella! What a great giveaway! I would LOVE the umbrella in Natural White and the cushions in Chamomile Terrace. SUCH a great giveaway! I like the Davidson Redwood umbrella and the Saddle cushion! I became a fan of Cushions and Umbrellas on Facebook. What about the pool? Somebody needs to give away a pool! What an AWESOME giveaway- My favs are Palm and thorndale opal! Marine stripe is gorgeous for the pillows..
Wow Linda! What a great week and what a great response! We are so happy to see so many participants, and a lot of people thinking with their hearts when they visited our site and made a donation to the Make A Wish Foundation. It's been great working with Linda on this great giveaway and we hope to be able to do it again soon. Thank you everyone for participating. We've closed off the page and Linda will be announcing a winner on Friday! Hang tight!